As we ushered in the new year, I shared with you how my primary goal for 2017 was to make my screen time more meaningful and more productive. My intention was to examine my new habits a month or two later, to ensure I was doing what needed to be done to achieve this. Month after month, I've guiltily recognized that I haven't gotten where I wanted to be. But now, six months later, I'm reluctantly taking a hard look at my screen time management. I'll begin by saying that I took some big strides in January, starting with unsubscribing from emails that no longer interested me. My inbox is very manageable now. Knowing that anything I receive is likely pertinent, either for work or volunteerism or personal life, I can check it a few times throughout the day, deal with the issue at hand, and be done with it. Anything I receive that is not pertinent, I delete. If it's a newsletter or update from a company I don't need, I unsubscribe before deleting. I got my Facebook feed cleaned up, too. Nearly everything I see now is fun and uplifting and informative of events in my community and region. As I mentioned in my New Year's post, I know that's not what everyone wants out of their social media accounts, but that's exactly what I want from them. And I am a happier person for having crafted it to that purpose. Now, the hard part. Not only am I still at my computer more minutes per day than I'd like to admit, but that time is also not as productive as it could be and I know it. Part of this can certainly be attributed to personal and professional changes occurring during this season, like ending commitments to some organizations and taking on new responsibilities for others, but I cannot allow change--which is inevitable--to stop me from managing my time better. If anything, recent changes require me to be a better steward of my time. - Turn on a podcast. - Open email. File messages that need no action and immediately handle messages that require action. This includes paying bills that need to be paid for which I've received an electronic notice. Pause the podcast when I need to focus on what I'm writing. Close email. - Open Facebook. Check notifications for items I want to share or to which I want to respond. Pause the podcast when I need to focus on what I'm writing. Take a couple of minutes--maybe five minutes--and scroll through my news feed to view photos and plans for upcoming events in the area. Close Facebook. - Open our online store page. Create shipping labels as needed. Close the store page. - Open eBay or any other buying or selling sites with which I have current business and handle business as needed. Close eBay. - Open Blogger. Achieve whatever items I have on my agenda for that day (writing, editing, reading comments, etc). Close Blogger. Now I'm offline, except for listening to the podcast or Pandora while completing any outstanding paperwork I have in my "to-do" file. Then I open Photoshop and start retouching photos or flatting comics pages, whichever I'm working on, and chip away at my current project. By this time I've usually had two cups of coffee and started on a glass of water. I've moved away from my desk a couple of times to put laundry in the washer or dryer, make the bed, or tidy up whatever may have been left out the night before. Most importantly, when Pip wakes up, I am easily able to stop what I'm doing and focus on her. If I didn't get through all the items that I was planning, it's no problem, because with my set order of operations, I know exactly where to pick up later when I have some free moments. It's still a work in progress, but I am much happier with this new morning routine than I was with the old. Later in the day continues to be a struggle, as I still find myself scrolling and reading and liking and commenting more than I need to be. But I'm getting there. And I have set a new goal going forward to maintain that focus of the morning each time I sit down at my desk. 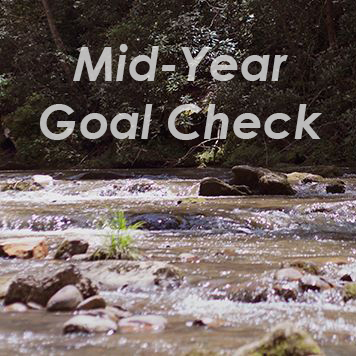 How often do you set new goals for yourself in your personal or professional life? How often do you evaluate your progress?